THE FINAL CHAPTERS: YOU DON'T LIKE ME!!!! OH--to be in upper elementary school and junior high again---those were the days--NOT! The recess chatter would go something like this, Supposed Friend #1-"NO ONE likes you!" ; Me---crestfallen ; Bully #1--"What a dweeb! 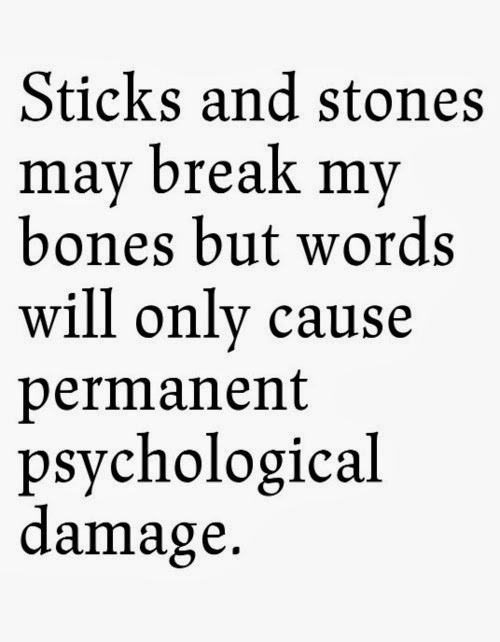 "; Me---shaking; Friend; #1--"Susie told the entire class you were ugly AND dumb"; Me---turning away; Bully #1--"HA HA HA---truth hurts" ; Me--slinking away. We learn at very young age to either be the concerned confidant, the bully, or the victim. 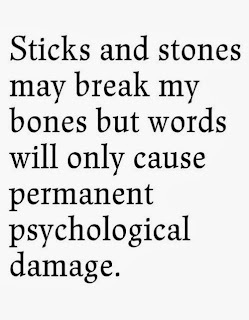 The words might not be sticks and stones--but they hurt! 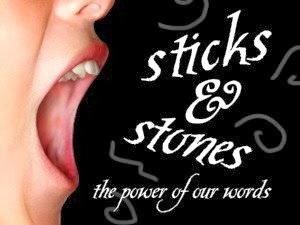 We learn to either be the one spouting the words or the one affected by them--it is a vicious game. One of the first things I began to realize as a single, with a lot of time to think, is that I am not really sure who I am. I have a basic idea---but also know I have spent my entire life trying to be the person someone else wanted me to be. That is an impossible task---for the line continues to be inched upward and just about the time you think you have met the expectations---a whole new batch springs up. In fairness--there has never been any verbal demands for who I should be---perhaps it was more my perception of what I was hearing and seeing that gave me the impression that I was coming up short. I also now understand that I was a reflection of the personal disappointment of my loved ones in their own failures. My not excelling was a reminder of their own short comings. SO bottom line---do I like myself? My sweet niece wrote a paper about my mother while in college and I recently reread it. She spoke several times of how proud Momma was of all her children. This caused me to stop and pause and wonder why I never felt I measured up to her expectations. I came to the conclusion that what sears our hearts are not the many points of affirmation, but instead those times when words cut us to the quick. For some reason, my mind and heart have chosen to store those in my soul---and therefore the feeling that I was always falling short. As with any relationship in our life, we make the conscious decision of key times we remember, and in all truth---this may be a skewed perception. While having a conversation with a new friend here in FW recently, I stated that I was trying to figure out just who I was with no one now influencing me. Not too long after I made the statement, it dawned on me that I should first decide who I am in the eyes of my Father. The core of who we are --the very essence of our being--begins with the One whose image we are created in. What are the things that I do know? I know that Jesus died a painful death so that I might live. I know because I have confessed and turned from my sin--that I am forgiven--and have the promise of eternity. I know that I am at peace with God since Jesus is my intercessor. I know that I am clothed in robes of righteousness because of Jesus. I know that I am a new creation following my acceptance of my Savior. I know that I am seated with Christ and have authority over the fallen world. SO I came to this conclusion---Will I listen to the world whose expectations I will never meet? Will I listen to Him--who looks at me through eyes of love and acceptance? I choose to know who I am---I am His beloved daughter whom He loves so much that He sent His son to die for me so that I might enter His presence for all eternity. He loves me so much--He provided the way out--I am grabbing on and knowing how precious I am in His sight. 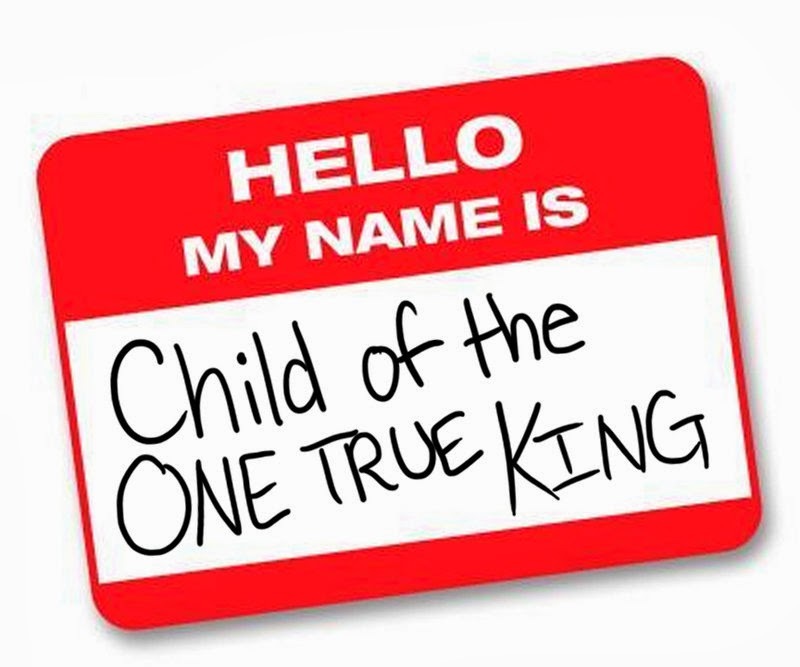 Who am I?---A child of the one true king! made us alive in Christ even when we were dead in transgressions.